When Jonny Imerman comes back to Cranbrook’s campus, it’s not just to visit Page Hall or stop by the Oval. He comes back to show upperclassmen how to give themselves cancer screenings. Imerman was diagnosed with testicular cancer at 26, a shock to a young man busy working during the day and completing his MBA at night. The diagnosis caused him to immediately change his course, and, in doing so, improve the lives of thousands. “As I was going through it, I had the support of my friends and family, but I wanted to talk to a peer who had gone through the same thing,” says Imerman. Yet there was no system in place to connect him with other survivors. 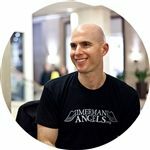 So he created one, launching Imerman Angels in 2004 with the singular goal of matching everyone diagnosed with cancer to a survivor of the same age and gender. “It’s such a powerful, simple idea,” he says. “And somehow it got overlooked for so many years.” He credits his Cranbrook background with giving him the courage to take on the task. The Chicago-based organization matches thousands around the world, but Imerman would like to find a match for every one of the 1.5 million Americans diagnosed with cancer every year. “As I learned at Cranbrook, we ‘Aim High,’” he says.